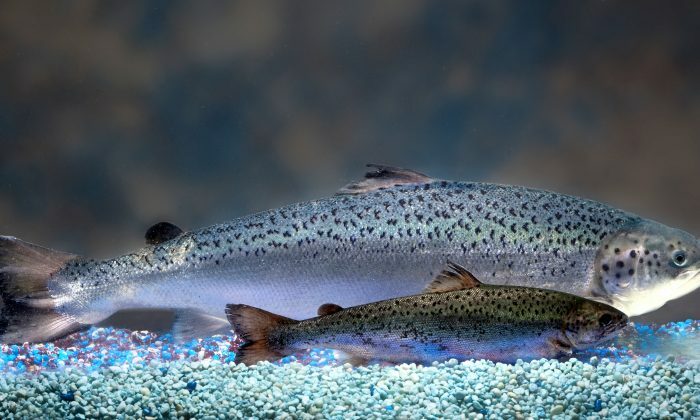 VANCOUVER, Canada—As the United States joins Canada to become the only two countries in the world to sell genetically modified salmon, GM opponents warn that not only does the fish pose environmental risks, but it won’t be labeled, so consumers won’t even know if they are buying it. In March, the U.S. Food and Drug Administration lifted an alert that prevented AquaBounty Technologies from importing GM salmon eggs from a test site in Canada to its facility in Albany, Indiana, where the fish will be modified to grow around twice as fast as regular Atlantic salmon. In Canada, a pilot sale of nearly five metric tons of the AquAdvantage salmon began in 2017, and in early April, a new facility in Prince Edward Island was approved by Environment Canada to expand production. The first commercial harvest from each country’s land-based facility is expected by the end of next year, with the P.E.I. facility harvesting an estimated 250 metric tons (550,000 pounds) annually, according to the company. But even though AquaBounty has surmounted more than two decades of safety tests and regulatory hurdles to get approval in both countries, opposition remains strong from GM opponents on both sides of the border. The Massachusetts-based company is currently facing a lawsuit launched by a coalition of U.S.-based environmental and fishing groups challenging the FDA’s approval. Westgate said nearly 2 million Americans left comments on the FDA website saying they don’t approve of the GM salmon, citing transparency issues such as the lack of clear labeling as a key issue. AquAdvantage salmon contain genetic material from Chinook salmon and ocean pout that make it grow to adult size in 16 months, compared to 30 months for regular Atlantic salmon. AquaBounty says the salmon will help meet demand for protein while easing the burden on overfished wild stocks, and will also reduce costs because they grow faster and require less food. AquAdvantage was first approved in 2015 by the FDA but was blocked from entering the United States later that year by Sen. Lisa Murkowski (R-Alaska) until federal labeling rules were put in place. After Congress passed a bill in December 2018 to include disclosure standards for biotechnology companies, the import ban was removed. But Westgate said those rules won’t take effect until 2022, meaning Americans won’t know if they are buying the first harvests of GM salmon, and once the disclosure rules are in place, the new regulation doesn’t require clear labeling; companies like AquaBounty can use codes that have to be scanned or a 1-800 number. “If the only way to sell this product to the public is to hide from them the fact that it’s been genetically engineered, then I think it demonstrates that there is a significant portion of the public that wishes to avoid consuming it,” she said. However, AquaBounty CEO Sylvia Wulf said the U.S. disclosure law will require a small symbol on any food with a GM ingredient on its package, including the company’s salmon. She said consumers should know the salmon has undergone 20 years of testing to establish it is safe for human consumption, the welfare of the fish, and the environment. 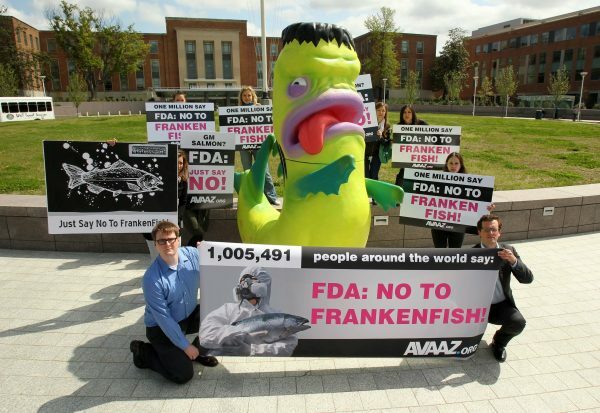 “I don’t know if consumers understand that we’ve been eating GMOs for 80 years and that they are perfectly safe for humans, as is our fish,” she told Brownfield Ag News. Since 2014, activists north of the border have demanded that the salmon be labeled, but that hasn’t happened, as labeling of genetically engineered products isn’t mandatory in Canada. Sharratt said surveys have consistently shown a demand for labeling, including a 2018 Dalhousie University poll that found 88.6 percent of respondents said genetically engineered food and ingredients should be labeled. She noted that almost all the major grocery retailers in Canada have rejected the sale of the salmon, while in the United States, 80 major grocery stores also refuse to sell it. Another key issue for opposition groups is the risk that the genetically engineered salmon could escape and negatively impact wild stocks, and how there has been almost no safety assessment done by either country in the event of an escape. But AquaBounty spokesman David Conley said given the extensive safeguards in place, that’s unlikely to happen. Conley added that the company is currently developing new gene-editing technology in order to ensure 100 percent that the female species are sterile. Another concern for GM opponents is that approval for sale of the salmon in the United States and Canada means a precedent is set for the expansion of genetically engineered animals for food, and there is no guarantee that other locations will maintain the same standards. Sharratt said AquaBounty has plans to not only expand its AquAdvantage harvesting facilities in the United States, but is also eyeing international locations such as China and Brazil. Despite assurances that genetically engineered foods are safe for human consumption, consumers remain cautious. As for AquaBounty’s GM fish in particular, the FDA said by email that a rigorous evaluation shows the salmon is safe to consume. “The FDA determined after a thorough review of the data that food from AquAdvantage salmon is as safe to eat and as nutritious as food from non-GE Atlantic salmon,” a spokesperson said. Sharratt and Westgate note, however, that the studies used in both countries to evaluate the safety of the salmon were carried out by the industry and are therefore inadequate. Correction: The article has been updated to indicate that AquaBounty is currently developing gene-editing technology in order to ensure that the female species of its genetically modified salmon are sterile. The Epoch Times regrets the error. A new kind of GMO is going by different names, and largely escaping regulation as it enters grocery stores. Farmed Salmon: Does Cheaper Fish Come With Increased Risk of Cancer?